I wanted to share a little more about playsilks ~ be prepared to feel the silkie love! When I discovered playsilks I immediately loved the idea of an open ended, child led toy that was tactile, bright and natural (100% silk). 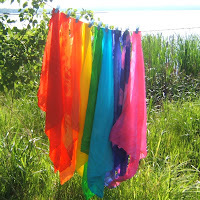 Experiments with dyes and dyeing lead to my own line of vivid playsilks (tie dyed and solids) ~ as pictured. We call ours 'silkies' and they are a favourite, daily play choice for Rowan. Last week she used the fireplace grate (?!) as a soap dispenser and stood on her blue silkie for a 'shower'. The blue silkie is also a swimming pool, lake and duck pond. The sheep graze on the green one and the orange is a favourite for fairy wings on a windy day. We hang them from the trees when we have a picnic and hide under them for hide and seek and peekaboo. They sling dollies and double as hats and dresses for tea parties (one must always wear a proper tea party hat, you know!). When Rowan needs *something* to make her play happen she seeks out her silkie basket and improvises. We twirl and dance with them. At church one Sunday our fire coluored silkies helped tell the story of Pentecost. Last night my mother borrowed one to wear as a belt with a summer skirt! Can you say this much about ANY other toy? Are you feeling the silkie love yet?